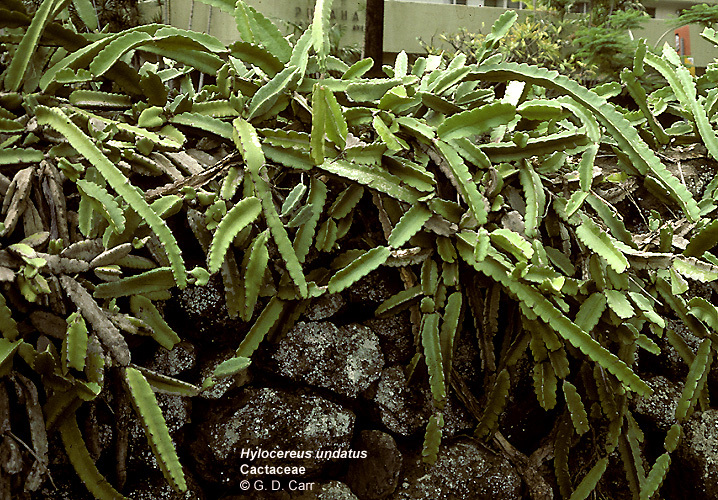 The Cactaceae are mostly spiny succulents with photosynthetic stems comprising 30-200 genera and 1,000 to 2,000 species further characterized by the presence of betalains, and p-plastids. The leaves are alternate, generally extremely reduced and ephemeral or absent, or rarely they are well developed and fleshy. 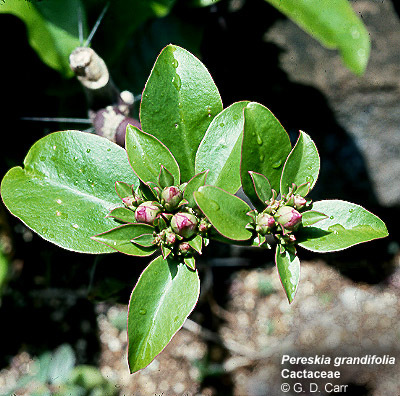 The leaves are associated with highly modified axillary buds or shoots called areoles that bear spines. 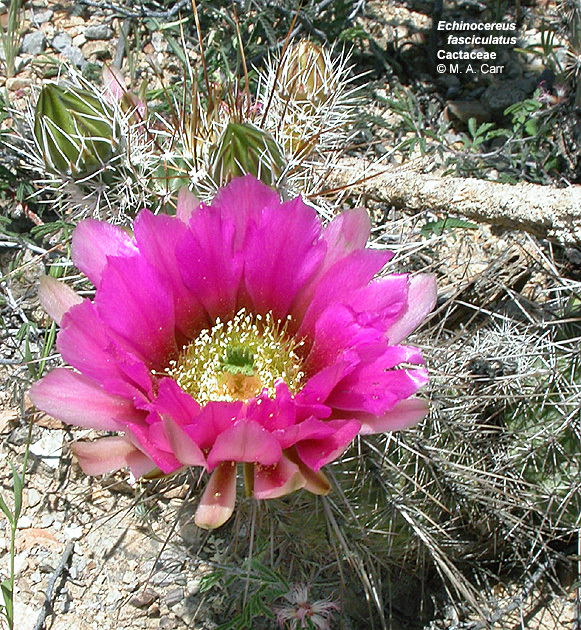 The flowers are mostly bisexual and actinomorphic and commonly have many weakly differentiated perianth segments arising from an epigynous zone. 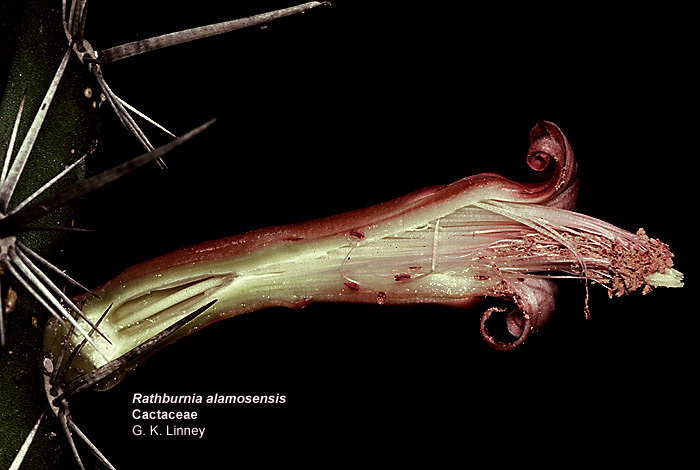 The androecium typically consists of a very large number of stamens arising from the inner face of the epigynous zone. The gynoecium consists of a compound pistil of 3-many carpels, an equal number of stigmas, and an equal number of parietal placentae with numerous ovules in the single locule of the inferior ovary. 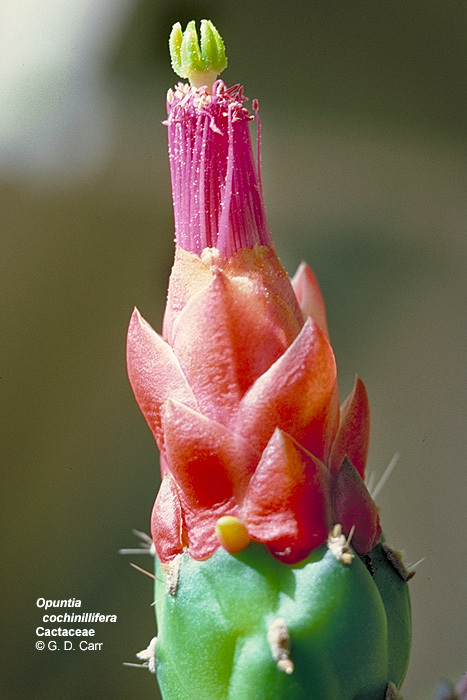 The fruit is a berry, often with spines or bristles. 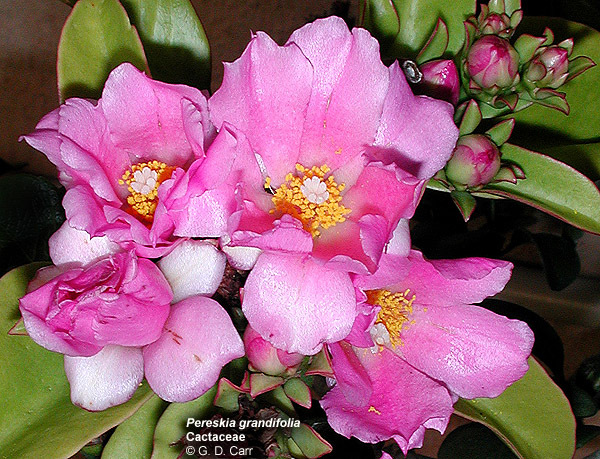 Pereskia grandifolia, Cactaceae, pereskia. Large shrub from Brazil with clusters of pink or white rose-like flowers, each about one and a half inches in diameter. 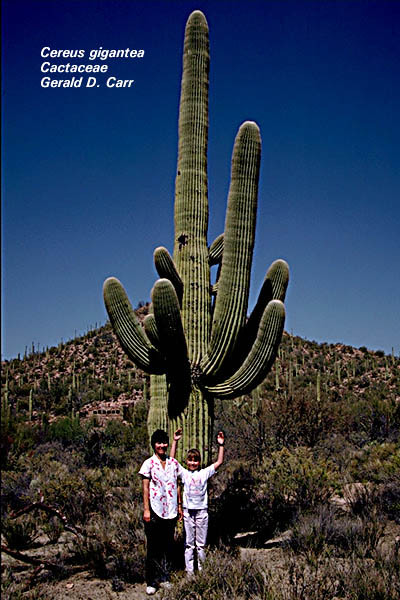 Although the plant bears a few spines that are characteristic of cacti, it is one of only a few species that also bear large foliage leaves. 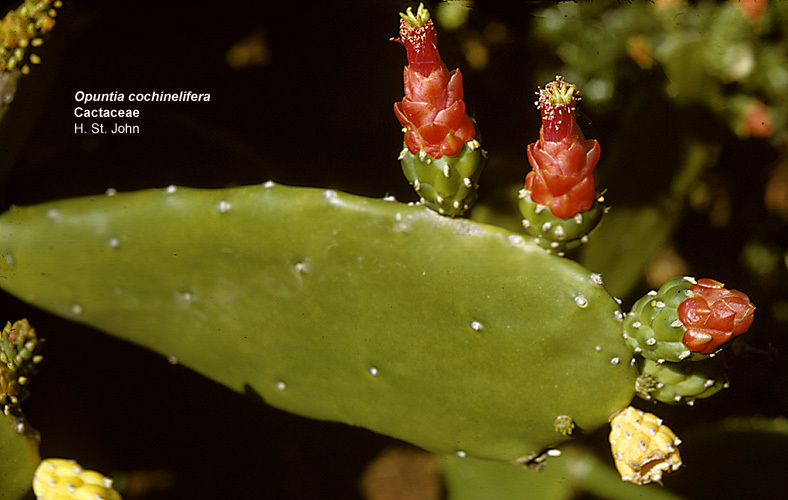 Opuntia cochenillifera, prickly pear. 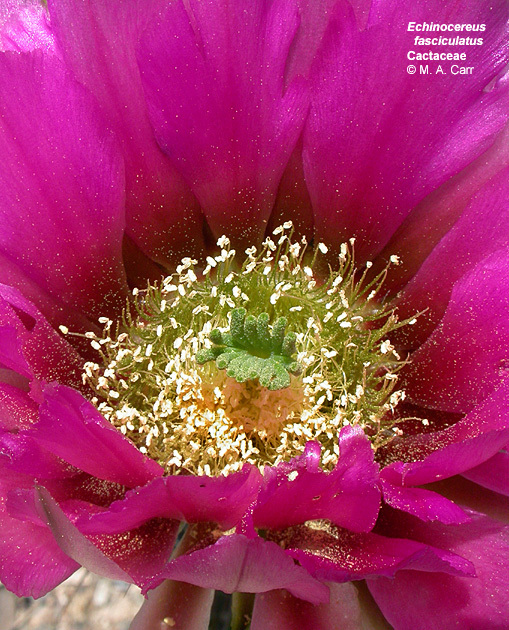 Note the numerous perianth segments and stamens and several green stigmas in this typical cactus flower. 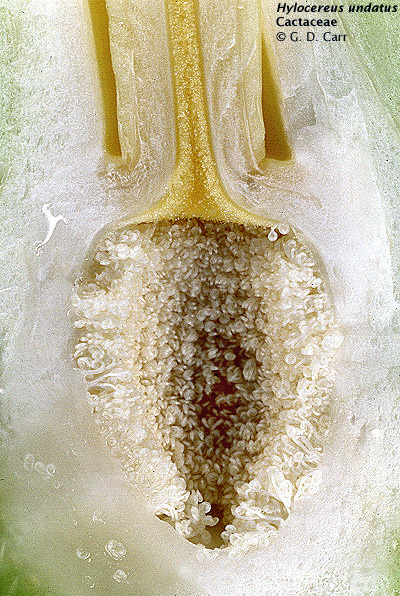 The ovary is sunken into the stem at the bottom of the photo. Also visible here are several areoles bearing bristles that would persist as the fruit matures. 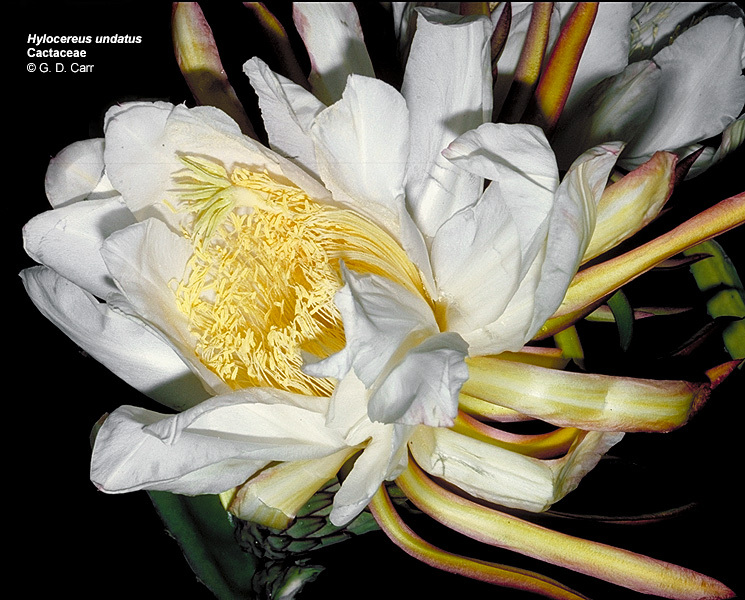 Hylocereus undatus, night blooming cereus. 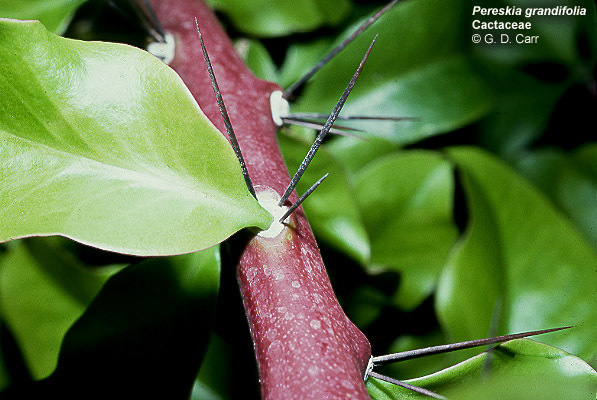 This well-known Punahou hedge cactus has many perianth segments and stamens. 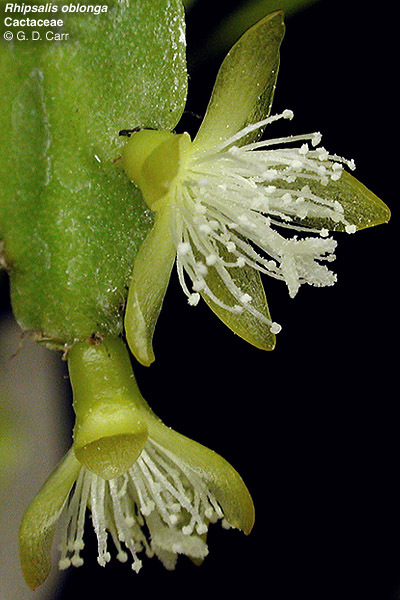 Note also the several pale yellow stigmas visible in the lower front part of the flower. The sectional view shows numerous parietal ovules in the single locule of the inferior ovary. 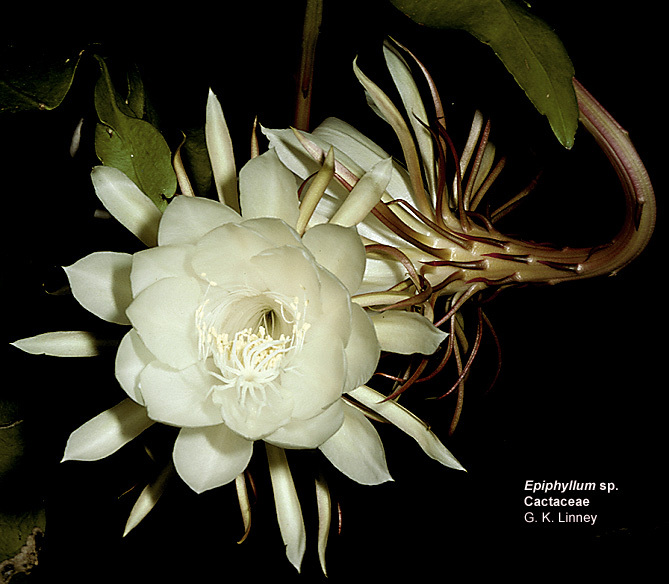 Epiphyllum sp., note the very long epigynous zone (hypanthium). Echinocereus fasciculatus, strawberry hedgehog, vic. 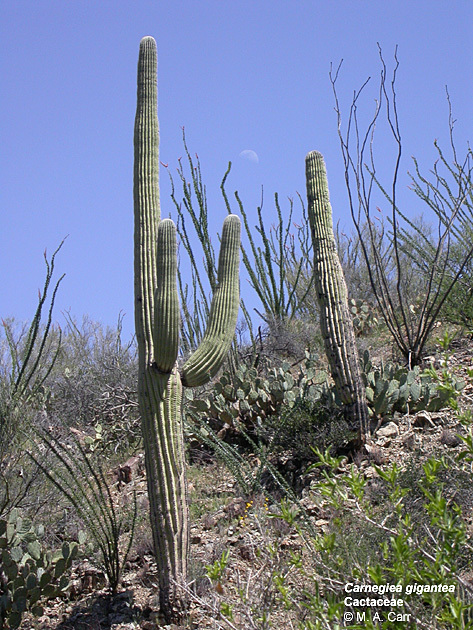 Saguaro Natl. Park, AZ, Mar. 2004. Rhipsalis oblonga. 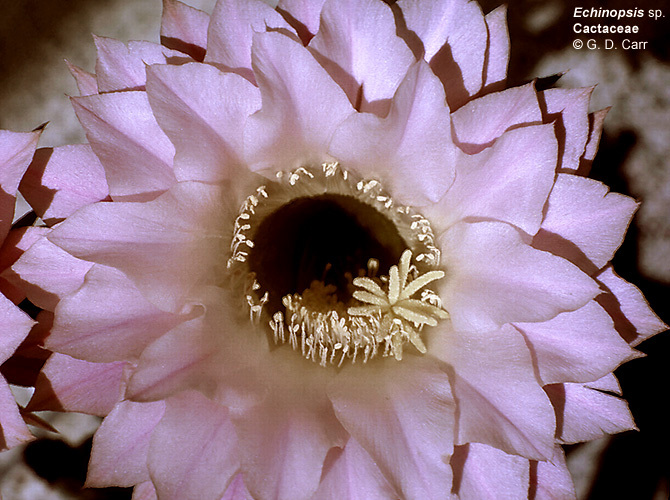 Although smaller than the average cactus flower, the blossoms of Rhipsalis are still fairly typical for the family. 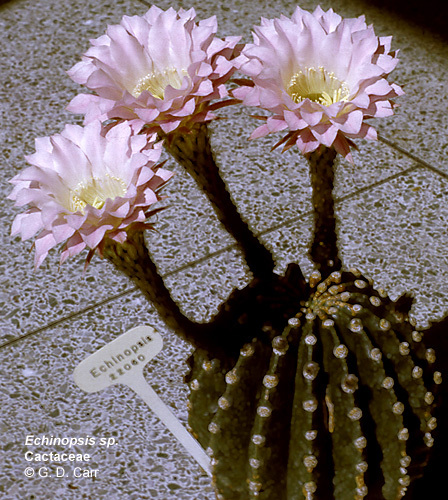 Cactaceae. 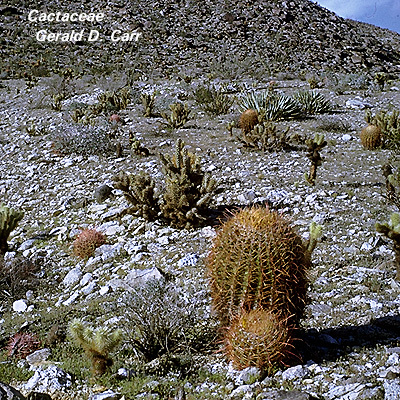 Barrel cactus, cholla, and other xerophytes are visible in this desert habitat.